When I was a little girl in Brooklyn, other kids would be helping their mothers to make gingerbread and spritz cookies, but in our house, it was always struffoli. Mom would start with a 5-pound bag of flour and a couple of dozen eggs. She would mix and knead the ingredients together until a smooth dough formed. Then the dough was left to rest under a clean kitchen towel and she would fill a big pot with oil. Then we would start slicing, rolling and cutting the dough until little bits. Once the oil was hot enough, she would carefully slip the pieces of dough into the hot oil, making sure all the while that we kids stayed far away from the hot pot. But I loved to watch as the struffoli turned from little pillow shaped pellets into crisp, brown puffs. When she judged them sufficiently browned, she would scoop out the puffs and drain them on paper towels. They were eggy and toasty tasting, but they really wouldn’t be at their best until they were thoroughly drenched in good honey. My mom didn’t think much of the supermarket brands, preferring instead to drive to a private home on Staten Island where the owner kept bees and gathered several different types of honey. My mom would ask for a blend of the light and dark honeys for a perfectly mellow flavor. 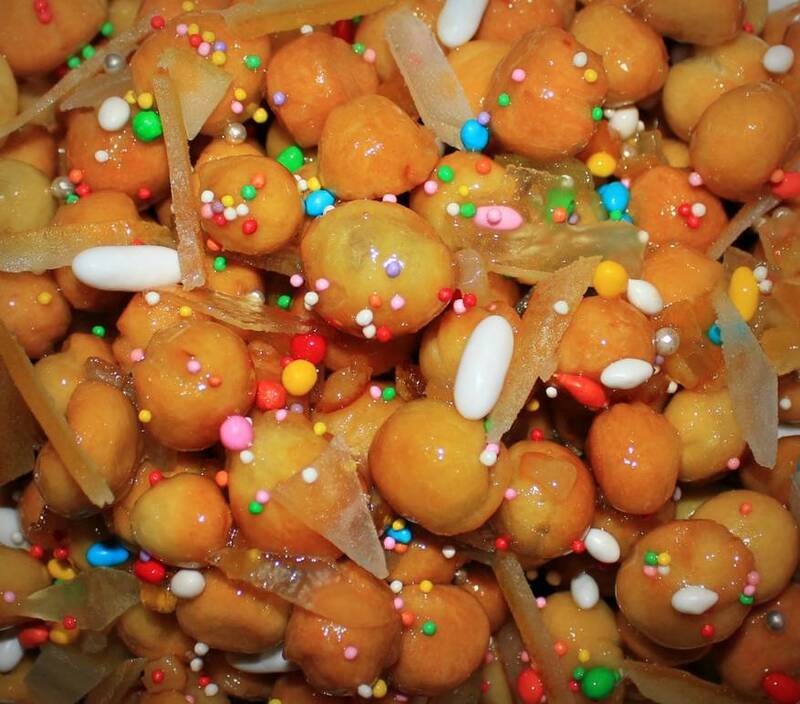 After tossing the struffoli with the warm honey came the fun part -- piling the sticky balls into heaps on platters and disposable pie plates to be given as gifts to friends and family. But before they could be given away, the struffoli needed to be decorated. We used little multicolored confetti and by the time we kids were done with the task, there were sticky finger marks and confetti all over the kitchen table and floor. Sometimes we added candied red and green cherries, or sliced almonds, or strips of candied orange and citron. Of course, we couldn’t resist tasting them to make sure they were as good as last year’s. The big platter would go on the sideboard where we could pick off a few whenever we passed by throughout the holiday season. The pie plates were wrapped in cellophane and tied with ribbons to bring to friends and family. Of course, they would give us plates of their own struffoli, but in my house, we all knew that mom’s were superior. They were crisp and light and never dense and hard like others we had tasted. A lot of Italian Americans have forgotten, or maybe they never knew, how to make struffoli, so I put them on the holiday entertaining menu I prepared at the cooking class I did at De Gustibus Cooking School at Macy’s on Thursday. Sure enough, while I was getting ready for the class, I heard one of the assistants enter and exclaim, “Struffoli! 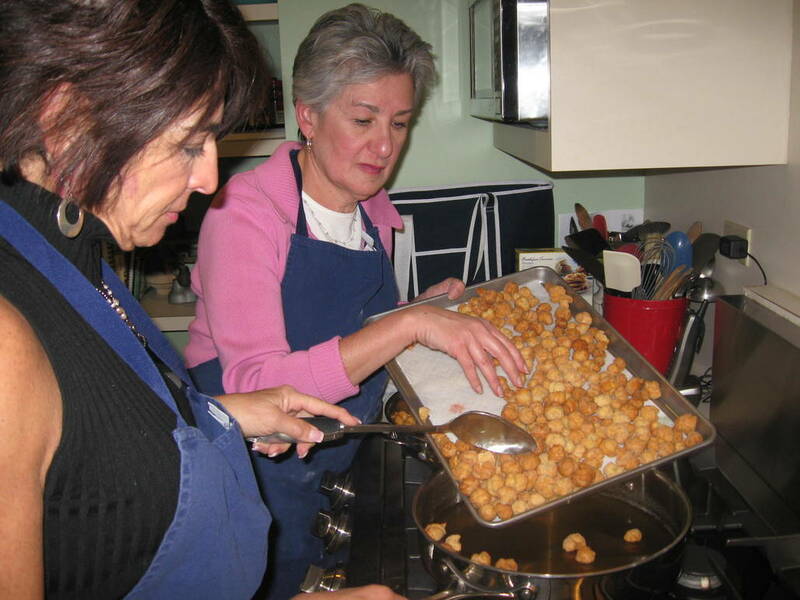 Hurray, we’re making struffoli!” I felt just like a kid again, making struffoli with my mom. Here’s my recipe for struffoli which I published in my book 1,000 Italian Recipes. It makes a plateful, enough for 8 to 10. If you want to make a big batch to give away, the recipe can easily be doubled. 1. In a large bowl, combine 1 cup flour and the salt. Add the eggs and lemon zest and stir until well blended. 2. Turn the dough out onto a lightly floured board and knead until smooth, about 5 minutes. Add a little more flour if the dough seems sticky. Shape the dough into a ball. Cover the dough with an overturned bowl. Let the dough rest 30 minutes. 4. Line a tray with paper towels. Pour about 2 inches of oil into a wide heavy saucepan. Heat the oil to 370°F on a frying thermometer, or until a small bit of the dough dropped into the oil sizzles and turns brown in 1 minute. 5. Being careful not to splash the oil, slip just enough struffoli into the pan to fit without crowding. Cook, stirring once or twice with a slotted spoon, until the struffoli are crisp and evenly golden brown, 1 to 2 minutes. Remove the struffoli with a slotted spoon or skimmer and drain on paper towels. Repeat with the remaining dough. 6. When all of the struffoli are fried, gently heat the honey just to a simmer in a large shallow saucepan. Remove from the heat. Add the drained struffoli and toss well. Pile the struffoli onto a serving plate. Decorate with the multicolored sprinkles, candied fruits, or nuts. 7. To serve, break off a portion of the struffoli with two large spoons or a salad server. Store covered with an overturned bowl at room temperature up to 3 days.